In the spirit of the month of October and everything that comes with it (yes I am speaking of Halloween), I have compiled an awesome list of some of Atlanta’s most haunted spots. I had the honor of working and collaborating with Atlanta based Illustrator Caleb Morris (and my fiancé) on an awesome ghost hunting starter pack kit. The kit will include postcard sets of some of Atlanta’s most haunted places, amazing illustrations by Caleb Morris, a map of the spots, and the history and hauntings of each location written by none other than me. This post features a sneak peek of some of my favorite locations in the kit. If you’re in the Atlanta area you should visit them… if you dare. Rhodes Hall is a beautiful castle in the heart of Midtown. 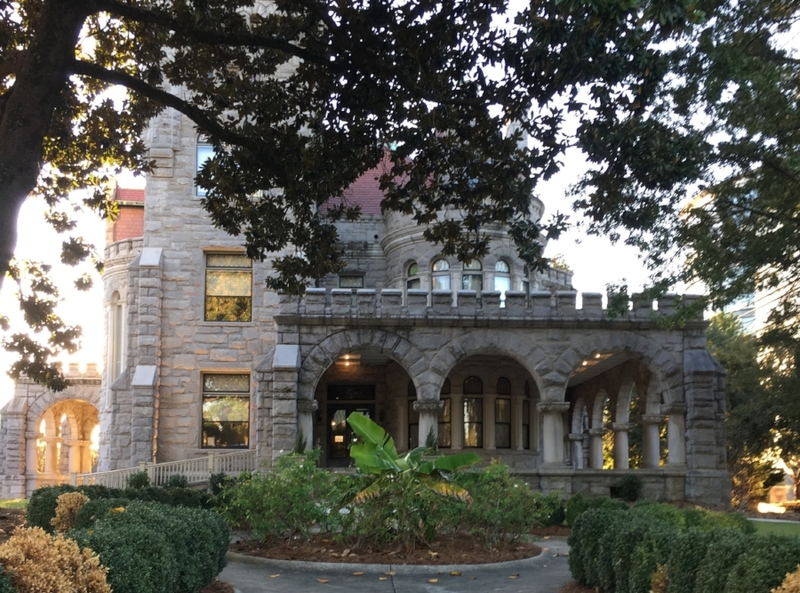 This castle on Peachtree Street was built in 1902 by furniture tycoon Amos Rhodes, and is known for its numerous ghost sightings. The ghost of Mrs. Rhodes, who passed away in the home, is rumored to haunt the halls of this famous castle. Visitors have reported hearing voices of laughing children and footsteps. Every corner of the castle seems to emanate an otherworldly presence. The basement of this opulent home is known to be haunted by an evil shadow man. In 1940s the manager of the Fox theater lived on the fourth floor, when his girlfriend mysteriously died there. Since her death staff and visitors have reported that the backstage elevators will mysteriously and randomly take patrons to the fourth floor. Others have noted sightings of the lights inexplicably shutting on and off, and ghostly apparitions of a male and female dressed in 1920s attire walking on the stage. In addition to those sightings the boiler room is haunted by a ghost named Roosevelt. On December 7th 1946 the Ellis Hotel (formerly known as the Winecoff Hotel) was the sight of the most tragic hotel fire in U.S. history. 119 out 280 guests died that night due to firefighters not being able to reach all of the guests. The hotel has since been renovated and changed its name to The Ellis, however some have experienced strange foot steps and odors in the halls, others have witnessed mysterious faces in the windows screaming in horror. Cemeteries have always been known for being haunted places and the Oakland Cemetery in Grant Park is no different. Built around 1850 this cemetery has over the years become home to many restless spirits. One of the most sighted spirit is that of a confederate soldier doing roll call (and getting answers), and another one is of a ghost of a woman looking for her beloved. This ten piece set features beautiful illustrations by illustrator Caleb Morris. If this post has intrigued you to go visit some of those spooky places or you’re interested in learning about more haunted places you can purchase one of the kits at Posman books in Ponce City Market, or Crafted in Westside and Lenox Mall. Happy ghost hunting and Halloween!